We have been planning this event for the last few months and have put together an all-star line-up of speakers and talent. Dealers from Canada have been flocking to the big shows in the U.S. (which is great!) over the past few years. DealerTalk is a chance for Kijiji to give back to the dealer community and reward them with the best of the best at an extremely reasonable rate. With high profile speakers such as Grant Cardone, New York Times bestselling author, and Scott Monty, global head of social media for Ford Motor Company, attendees will leave with renewed sales energy and refreshed marketing strategies for 2013. “Too often business owners get distracted by what their competitors are doing instead of focusing on how to really master their space,” says sales expert Grant Cardone. 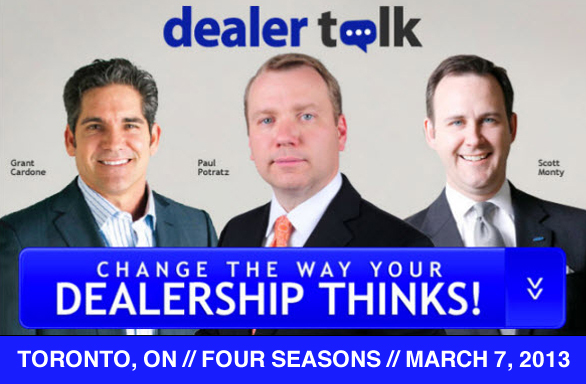 “I’m thrilled to be part of Kijiji’s first DealerTalk conference, so I can give Canadian dealers real insight and proven techniques on how to dominate their market in 2013”. As a long time DealerRefresh reader I wanted to give back to this amazing community of car dealers and industry professionals. The event is already an extremely reasonable offer at only $149, BUT if you use this promotional code you get to see all these great speakers for only $99! This event is open to dealers and industry folks. Kijiji Autos is the most visited car site in Canada with more than 4 million unique visitors per month (comScore, November 2012). On average, there are over 300,000 live listing of cars and trucks on Kijiji Autos, which users can search & refine, create custom alerts for, and save their favourite vehicles to a watchlist. Ryan Thompson is the Head of Sales @ Kijiji Autos, Canada’s #1 Automotive Classified Site. He also leads his men’s hockey league team in penalty minutes, shares thoughts and ideas on his own blog http://thedealergeek.com, and is the unofficial Canadian DealerRefresh cheerleader.